A bona fide 4000+ fps varmint-slayer, the .22-250 is probably the most popular mid-sized cartridge in existence. First wildcatted in the 1930s off the Savage 25-3000 parent case, the .22-250 is widely used throughout the world, and all the major rifle-makers chamber for this fast, versatile cartridge. Though it was popular for decades among varminters, the .22-250 really took off when Remington standardized the cartridge in 1965. Now, in any large sporting goods store or gun-shop, you’ll find a wide selection of factory ammo with bullet weights from 35 grains up to 75 grains. And the .22-250 is far from “old hat”. Just this year, Hornady introduced .22-250 SuperFormance ammo that achieves hitherto unheard-of velocities with 50gr bullets. Though used primarily for varminting, the .22-250, with the right bullet, can be a capable deer-hunting round, and it has been used successfully in High Power competition. 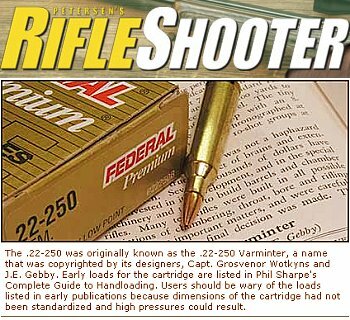 If you shoot a .22-250, or are just interested in the history of the cartridge, Peterson’s RifleShooter Magazine offers a fascinating article by Terry Wieland. 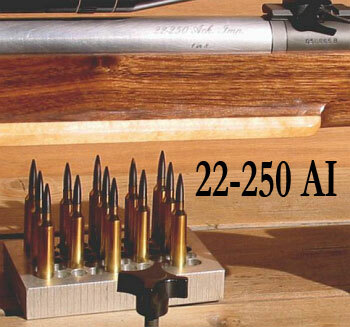 The author explains how the .22-250 was developed in the late 1930s and was initially known as the .22-250 Varminter. In 1963 the round gained popularity when Browning chambered it in a production rifle — even before factory-loaded ammo was available. The .22-250 shoots a wide range of bullets very effectively, from 35gr flat-based varmint bullets, to ultra-long 90gr VLDs. However, you’ll need the right twist rate for your choice of bullet. For max velocity and accuracy with the lightest bullets, a 1:14″ twist may be ideal. More versatile is a 1:12″ twist that will allow you to shoot the popular 60-64 grain match bullets. For normal lead-core jacketed bullets, a true 1:9″ twist will let you shoot up to 75gr bullets (except some longer VLDs). The Hornady 75gr BTHP shoots very well in a 9-twist .22-250. Since most .22-250 Rem shooters prefer bullets in the 50-73gr range, a good “do-it-all” solution is a 9-twist. Overall, what twist rate is best? For all-around use, including 500-600 yard ground hog matches, we like a 9-twist. That will let you shoot some pretty-high-BC bullets at long range without “choking” the lighter bullets too much. If you don’t plan to shoot at long range, a 12-twist barrel will do the job. The slower twist will give you a bit more velocity, and minimize the risk of jacket failure at high rpms. That’s one reason why the majority of factory .22-250 rifles are sold with 1:12″ twist barrels. Savage does offer some 9-twist barrel options. That’s nice if you shoot in windy conditions and need to stabilize a longer bullet. If you plan to use your .22-250 for across the course (high power) competition, you’ll want to use the 77-80 grain boat-tail match bullets. For those, we suggest an 8-twist barrel (as long as it is a true 1:8″ twist). That will let you shoot the excellent 77gr and 80gr Sierra MatchKings, and 80gr Bergers. 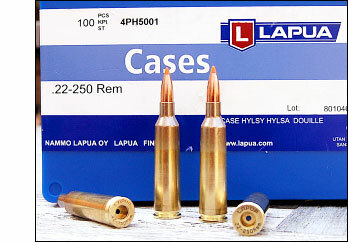 With Lapua now making .22-250 cases, shooters now have a clear “best choice” for .22-250 cartridge brass: Lapua. Though Norma-brand .22-250 brass is also very good, the new Lapua brass is even more consistent, and it is stronger. You’ll find, after multiple reloadings with stout loads, that the Lapua brass is still good to go, while other brands of brass may exhibit loose primer pockets. Like Lapua’s 6mmBR brass, the new Lapua .22-250 brass is now the standard by which all other brands of .22-250 brass are measured. 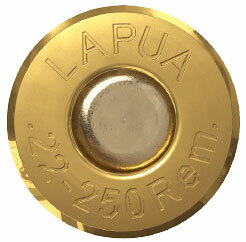 If you can afford it, buy the Lapua, confident that you are getting the best .22-250 brass on the market today. Forum member William P. (aka “Heath”) just got two boxes of the new brass. Both boxes have the same lot number. Heath was kind enough to sort the brass and report his findings. Based on Heath’s 200-count sample, we can say this new brass is very, very consistent in weight. The total weight spread (delta) for 200 cases was just 1.4 grains! And the vast majority, 83%, were within 0.7 grains in weight (160.3 – 161.0). For the varminter, sorting may be superfluous. Lapua delivers a very consistent, high quality new product, and we love the new, blue plastic boxes. After Lapua, what brass should you buy? As noted, Norma brass is very good, but it normally costs more than the Lapua brass so there is no real advantage — unless you already have a supply and want to keep things consistent. Among domestic manufacturers we recommend Nosler, Winchester, Remington, and Federal brands in that order. Some people say the Winchester brass is more durable than Nosler. Other folks have suggested that Nosler actually IS weight-sorted Winchester, but we can’t confirm that. If we used a .22-250 rifle in “run and gun” tactical matches where we inevitably lost a great deal of brass, we would substitute Remington for the Lapua brass, just because it much, much cheaper. The .22-250 is a versatile cartridge, commonly used to shoot everything from 35gr frangible bullets to 80gr long-range match bullets. Because, relatively speaking, the .22-250 is an “overbore” cartridge, you’ll want to use powders that are a class slower in burn rate than you might use with the .223 Rem or 22 BR. Using a slower powder can, some folks believe, also extend your barrel life — but how you shoot is just as important to barrel life as is powder selection. Avoid sustained rapid firing, allow your barrel to cool between shots, and monitor barrel fouling. Build-up of carbon and copper fouling can increase barrel heat and pressure. Because .22-250s are commonly used in the varmint fields on hot summer day, you’ll want to choose powders that are not overly sensitive to hot temperatures. Hodgdon’s Extreme powders are good in this respect. These are extruded (stick) powders, however, and if you load with a progressive press such as a Dillon 550, the extruded powders may not measure as smoothly as ball powders such as H414. For the light 35-45 grain bullets, H414, IMR-3031, and H322 are good choices (though there are many others). For the 50-60 grain bullets most commonly used in .22-250, you have a huge selection of good medium burn-rate powders, but we like the new IMR-8208 XBR powder and H-4895 because they deliver great accuracy and they are not temp sensitive. If you plan to shoot the heavy 75gr to 80gr bullets (and you have a barrel with appropriate twist rate), you’ll need a slower burning powder such as H4350, H4831sc, or Ramshot Big Game. Vihtavuori N550 has been popular with guys who shoot the 75gr to 80gr bullets because it yields excellent velocity. However, N550, a double-base powder, is much more temp sensitive than H4350. The .22-250 uses large rifle primers. There is no one “perfect” LR primer for the .22-250 cartridge. The optimal primer choice depends on numerous factors including powder, bullet, brass type, seating depth, load density, and even your gun’s internal barrel dimensions. That said, if you are shooting a factory rifle, such as a Browning, Howa, Remington, Savage, or Winchester, we recommend starting with CCI-brand primers. CCI primers boast harder-than-average primer cups. Factory rifles have ample clearance around the firing pins. This can promote early primer cratering even when pressures are below rated max. If you use a primer with a soft cup, you can get extreme cratering, or even a pierced primer when running stout loads. With their hard cups, CCI primers won’t crater as much, giving you an extra margin of safety. Russian (Wolf and Tula) primers also have fairly thick cups and these can be a good choice too. The Russian primers are relatively inexpensive and they have a good reputation for delivering good accuracy with low ES. However, there is a down-side. The Russian primers tend to require more seating force to seat properly, and we have observed the occasional quality control problem — a primer that is dimensionally off, or a primer that simply fails to ignite on the first strike. If you’re in the National Championship, that’s a big deal. If you’re on a varmint hunting trip, shooting hundreds of rounds a day, Wolfs will probably work fine. When tuning your loads, don’t hesitate to try different brands of primers if accuracy or velocity is disappointed. Primers do make a difference. We have seen some rifles exhibit significant accuracy gains when switching from CCIs to Federals or vice-versa. Likewise, when moving from one brand of bullet to another you may want to experiment with primer types. Also note that while your powder may be insensitive to temperature changes, your primers may not! This point was explained to us recently by Chris Hodgdon of Hodgdon Powder. He explained that a powder which shows very uniform velocity over a wide temperature range may perform worse with a different brand of primer. In tests with Varget powder in a .308 Win, Hodgdon found Winchester primers helped minimize temperature-based variations. A Hodgdon technician told us: “We use the Winchester LR primer for this test because it shows little to no sensitivity to temps. The next least sensitive is the Federal 210M, but it does show some movement.” This comment applies ONLY to Varget in a .308, but it does illustrate the point that primers as well as powders, can be temp-sensitive. There’s a huge selection of .224-cal bullets for the .22-250 Rem, ranging from 35 grains all the way up to 90 grains. For close-range competition (100-300 yards) one can find a large variety of 50-53gn Match bullets, both custom made and commercial. The Sierra 52gr BTMK is a popular “short-line” load with Highpower shooters. Custom 52s in .224 caliber are offered by the benchrest bullet-makers, such as Bart Sauter, Lester Bruno, and Don Gentner. Lester also makes a very accurate 57. We’ve had very good luck with Bergers in the 50-65gr range. Berger offers a panoply of options, with Berger FB bullets offered in 50, 52, 55, 60, 62, and 64-grain weights. This wide selection lets you literally “pick your BC”, from .241 for the 50, to .306 for the 64 grainer. If you’re looking for do-it-all bullet that can shoot bugholes on paper and also perform in the varmint field, these Bergers will fit the bill. For the mid-range varminters there are even more options available in the 68-80gr weight range–many illustrated on this page. Check out the 69gr Lapua Scenar (.321 BC), 75 A-Max (.435 BC), and Berger 75gr VLD (.447 BC). Some guys have asked us: “Please don’t tell people about the 75 A-Max. Right now these are super cheap, and they shoot like a house on fire.” The A-Maxs are indeed a major bargain. Midsouth Shooters Supply sells the 75gr A-Max for just $13.79/100, and the 80gr A-Max for $14.92/100. Sweet deal. The 77gr and 80gr Sierra MatchKing are probably the “default” 22-Cal bullet choices among long-range Highpower shooters today, but we have heard many good reports about the 80gr A-Max and the 75gr and 80gr Berger Match VLDs. If you’re shooting an 8-twist barrel at long range, you should try all the options and see what shoots best in your barrel. The new 90-grainers from Sierra and Berger caused a stir when introduced in 2006, but we haven’t heard many reports from shooters using them in competition, possibly because one needs a very fast twist barrel (1:6.5″ is preferred), and the 80s already shoot so well. Ultra-high-velocity .22-250 ammo loaded with very light bullets is becoming more popular. 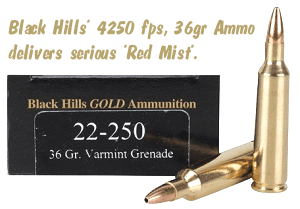 Black Hills sells .22-250 ammo loaded with 36gr Barnes Varmint Grenades. With a predicted velocity of 4250 fps, these will deliver serious “Red Mist” effect. Winchester offers a high-velocity (4350 fps) round loaded with 35gr lead-free Ballistic Silvertips. Remington UMC Ammo hits the 4000 fps mark with its UMC ammo loaded with 45gr JHPs. Since the .22-250 is such a popular cartridge, all the major die-makers offer reloading dies. It’s hard to go wrong with a Redding Type ‘S’ Full-length bushing die — item 77106 for the standard .22-250 and item 77406 for .22-250 Rem Imp 40°. This will both resize the case (and bump the shoulder) as necessary, and allow you to adjust neck tension with bushings. Alternatively, you can go with a body die (item 75106), and a separate neck bushing die (item 78106). If you load primarily one brand of bullets, another slick set-up is to buy a Forster full-length .22-250 sizing die (item 005221), and then send it off to Forster to have the neck honed for your desired amount of tension. Forster charges just $10 plus shipping for this service. This elegant one-pass sizing solution produces very straight rounds with low run-out. We also believe that doughnuts (in the neck) form less readily if you full-length size with non-bushing dies as opposed to using bushings. Bushing dies leave a little bit of the neck unsized, and that’s where the brass can build up. For bullet seating, both the Redding Competition Seater (item 55106) and the Forster Ultra-Seater (item U00031) work great for the standard .22-250 case. If you shoot a .22-250 40° AI, Redding’s .22-250 AI Comp Seater (item 55907) costs quite a bit more than the standard version and Forster doesn’t list a .22-250 AI seater in its catalog. However, you can just run your chambering reamer into the inner sleeve of either die to fit the Improved case. If you want the “Cadillac” of production seater dies for the .22-250, order the Wilson stainless seater with micrometer top (Sinclair Item 22250STAINLES) from Sinclair International. Costing only a few dollars more than a Redding Comp seater, this die is a joy to use, providing very positive control over bullet seating depth. When used with a quality arbor press, the Wilson offers unrivaled “feel” for bullet-seating force. This can help you monitor neck tension, one of the most critical factors in maintaining low ES and SD for long-range accuracy. H322 36.0 Fed 210M 35 Horn V-Max 4350 fps Very Accurate Load, meters well. Near Max. Benchmark 37.3 Fed 210M 36 Barnes 4300 fps Max Hunting Load. IMR-3031 36.5 Fed 210M 40 Sierra BlitzK 4200 fps Max Hunting Load. IMR-3031 34.8 Fed 210M 45 Barnes X 3900 fps Max Hunting Load. VV N135 35.4 CCI 200 45 Sierra SP 3900 fps Sierra Hunting Load. H4895 36.1 CCI 200 50 Sierra BlitzK 3820 fps Accurate Load. Non temp-sensitive powder. IMR 8208 XBR 35.2 CCI 200 55 Speer SP 3730 fps Wide Loading Window with this powder. H4895 34.8 CCI 200 60 Horn V-Max 3550 fps Very Accurate if bullets sorted. Win 748 35.8 Fed 210M 60 Sierra HP 3550 fps Powder Meters Like Sand, but Temp Sensitive. Reloder 15 35.0 CCI 200 64 Berger Varm HP 3450 fps Try Bergers in Lands, but back off 0.3 grains. H4350 36.2 Fed 210M 69 Sierra MK 3100 fps Very Accurate, Low ES. Also Try Wolf Primers. Big Game 35.0 Fed 210M Horn 75 BTHP 3230 fps Good, Inexpensive Predator Bullet. IMR-4831 36.6 Fed 210M Sierra 80 MK 3050 fps Sierra Manual Accuracy Load. WARNING: ALWAYS start 10% below these loads and work up. Pressures can vary dramatically from one barrel to another. Seating depths have a huge effect on case pressures–moving the bullet just .015″ one way or another can push a “safe” load into the danger zone. Powder lot variances can be extreme–you may have to adjust a full grain or more. Whenever you buy new powder, even the same brand, start 10% low. NEVER assume pressures will be safe if you change lots or ANY component. Case web growth is probably the most reliable indicator of over-charge. By the time you’re getting stiff bolt lift or ejector marks with fresh brass you’ve exceeded proper pressure levels. Ambient temperatures can alter pressures considerably. Don’t assume cold weather loads are safe in summer. As you approach max loads, reduce the load increments. Just 0.2 grains can make a difference. Drop and Wind-Drift calculated with Point-Blank Software for 70° F temp, and 1000′ altitude. BCs were 0.420 for 80 SMK, 0.535 for Berger 105 VLD, 0.585 for 115 DTAC. A proper varmint rifle with a fat fore-end and stainless action and 26″ barrel, the Savage 12 VLP DM is ready-to-run right out of the box. With a strong, pillar-bedded laminated stock, and fluted 26″ heavy barrel, the 12 VLP DM can often deliver 1/2-MOA groups with tuned handloads and can easily shoot under 1 MOA with factory ammo. This model offers the flexibility of Savage’s new Detachable Box Magazine (DBM) — you can make quick follow-on shots, or easily switch mags to change ammo types. For 2010, you can get either a 1:9″ twist or 1:12″ twist barrel in your .22-250 model 12 VLP DM. We recommend the 9-twist version as it lets you shoot heaver bullets at longer ranges. The AccuTrigger can be adjusted down to about 1.5 pounds, so all you really need is to skim-bed the action and add a scope and you’re ready for the varmint fields. MSRP for the 10-pound VLP DM is $1041, with street price around $900. Both Right- and Left-hand versions are offered. If you don’t need the DBM, and prefer a 12-twist barrel, consider the single-shot model 12 BVSS which retails for about $120.00 less. The Model 700™ VL SS Thumbhole (item 27447) in .22-250 represents one of the better values in the current Remington line-up. The VLS offers a stainless action with 26″ heavy ss barrel (1:14″ twist) with target crown. The laminated thumbhole stock has a roll-over comb, and a wide beavertail fore-end for stability in front bags. The thumbhole grip is nicely designed and comfortable in the hand. This is an easy gun to steer in the bags. Suggested retail for the Rem 700 VL SS Thumbhole is $1085.00. Street price varies widely — we’ve seen these advertised from $820 to $950.00. The Howa m1500 Ranchland Compactin .22-250 is an excellent rifle for the price (MSRP is $550.00). This handy walk-around varminter has a blued action and 20″ barrel and weighs just 7.15 pounds. The m1500 Ranchland compact features a Hogue “over-molded” stock (with pillars and textured grip areas) in either black or OD green colors. As shown in the photo above, the Howa Ranchland Combo Package is also offered in Sand or Camo finish. The Ranchland Combo comes with a one-piece scope rail and a color-matched, Nikko Stirling 3-10×42 Nighteater™ riflescope and rings. These scopes and rings are anodized to match the color of the stock of the rifle. MSRP on the Ranchland combo is just $625.00. This short “truck gun” fits easily behind the seat of a pickup truck, or in an ATV rack. The action is strong and smooth, and the barrels are probably a bit better, on average, than you’ll get from Remington. Rifle Shooter Magazine Cartridge history, Powder Choices, Load Data. 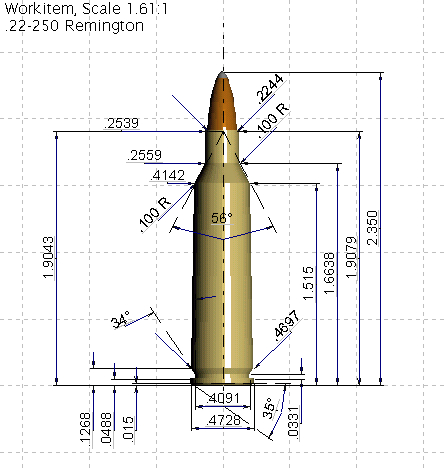 .22-250 Remington, Wikipedia Article Extensive history of Cartridge. Worth Reading. .22-250 Load Tables, Reloaders Nest Hundreds of .22-250 loads for 35 to 80 grains. .22-250 AI Load Tables, Reloaders Nest Wide Selection of .22-250 Ackley Loads. .22-250 Load Map, from Handloads.com Extensive .22-250 Load Data Submitted by Readers. In our Shooters’ Forum, there has been an interesting discussion of the 6.5×47 Lapua case necked down to .22 caliber. Forum members discuss the pros and cons of a “22×47 Lapua” wildcat versus the classic .22-250 or a .22-250 AI. “I have personally had a love-hate realtionship with the 6-6.5×47, finding it painfully inconsistent from one day to the next. and would have to be really pushed into the idea of doing another, especially in a smaller caliber, however, the new .22-250 lapua brass is very easy to make into *X47 Lapua brass. The clear reason for doing a .22-6.5×47 over a .22-250 AI was the lack of .22-250 brass from Lapua. Now that is no longer a problem. Although I did experiment with 6XC Norma brass in a 6-6.5X47 Lapua in order to see if the flash hole was a factor, the results were no different than Lapua brass, so I do not ascribe to the notion that the small flash hole/prmer is a deficit in the 6.5×47 Lapua brass. Topics: .223, .224, .22-250, 22-250 Remington, .22-250 Remington, 22-250 Ackley Improved, 22-250 AI, 5.56, 5.56, 5.56mm, 5.56 NATO, Reloading, Bullets, Lapua, Norma, Winchester, Remington, Speer, Hornady, TripleShock, X Bullet, Partition, Nosler, Sierra, MatchKing, Blitz, BlitzKing, V-Max, Vmax, hollow point, boattail, boat-tail, BT, HPBT, powder, gunpowder, H414, Varget, H4350, H4831, H4831sc, IMR, IMR 4064, IMR 4350, H-1000, H-414, Vihtavuori, N135, N-135, N140, N-140, N-160, N165, N-165, N170, N-170, N560, N-560, brass, Load Map, Reloading Recipes, WLR, CCI Primer, CCI BR4, Federal Primer, Fed 210, 210m, Savage 12-BVSS, Savage LRPV, Accutrigger, Remington 700, Varminter Supreme, factory 22-250.